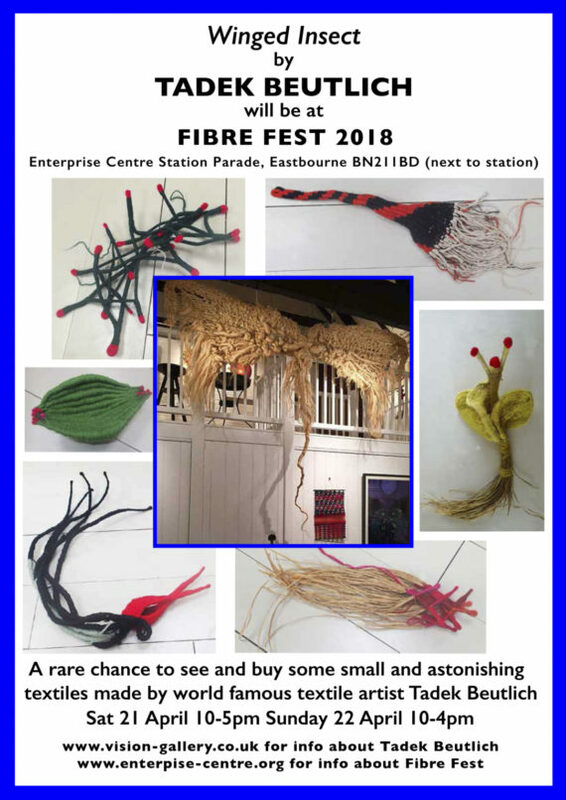 Come to sunny Eastbourne next weekend to see textiles by Tadek Beutlich at Fibre Fest 2018 at the Enterprise Centre (next to Eastbourne Station). Also on display and for sale will be many of the smaller textiles made by Tadek Beutlich himself, so a rare chance to see, handle and buy your own piece. Find me upstairs at the Fibre Fest on Saturday 21 April 10-5pm and Sunday 22 April 10-4pm along with a host of other talented and amazing textile artists, individual shops and The Makery artists co-operative shop will all be open. Also delicious food, a vegan cafe and on Sunday there is live music from Milton Hide too. Some exhibitors will also be in marquees outside.And of course the beach is just a short walk away! https://www.facebook.com/SussexCraftandDesignFair/ for more info and www.enterprise-centre.org for info about Fibre Fest.